Muluba is a resilient 25 year old woman. Born in Middlesex, England to Zambian parents, Muluba moved to Canada when she was a toddler. Test results after a health scare revealed that Muluba was born with HIV, contracted from her parents who were unknowingly infected and passed it on. Muluba was raised to keep her HIV a secret – a common decision by many people living with HIV. ​As a child and teen, this was both confusing and alienating, as she didn’t understand what she did wrong. Her feeling of isolation was further heightened after losing both her parents to AIDS related complications. ​Devastated, Muluba stopped taking care of herself. As someone living with HIV, her daily medical regimen was key to her health and survival. Her viral loads climbed dangerously, and her immune system declined to nearly nonexistent. Muluba’s doctors were worried she might die. Determined to recuperate, refocus, and ultimately recover, Muluba took charge. She began to study journalism and soon realized her own story was worth sharing. In 2014, Muluba disclosed her status while volunteering at a local World AIDS Day event and, just a few days later, she recorded and posted a five-minute video titled, Feel No Shame, online. A natural in front of the camera, Muluba was interviewed by national media, and featured in a number of articles. Muluba’s story includes themes of resilience, self-care, leadership, and empowering others in the face of adversity. 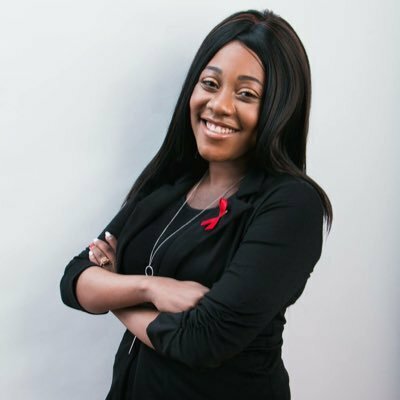 In her role as the Canadian Foundation for AIDS Research’s National Youth Ambassador, Muluba educates, engages, and empowers Canadian youth across CANFAR’s national awareness program, One and All.